The Zintronix Z-Swivel gives you the ability to tune-out unwanted UV noise, so you can avoid faults resulting from a "flame on" signal during ignition trial. 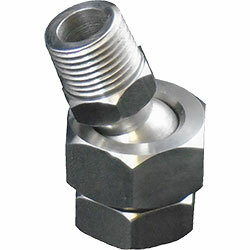 Loosen the central nut to allow free movement of the swivel fitting, and tighten it once the desired position is found. Available in three popular sizes: 1/2″, 3/4″, and 1″ NPT.